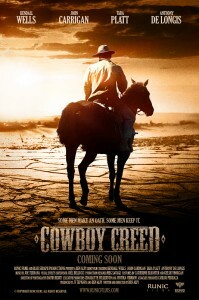 Runic Films and Blue Seraph Productions are proud to announce that their “mini epic” short film Cowboy Creed is now available to view on their website www.runicfilms.com. The short Western film recently completed its festival run with two award nominations at the Action on Film Festival; for Best Western Short Film and Anthony De Longis (Sheriff Eli) was nominated for Best Supporting Role in a Short Film. View the complete film HERE.